The masterful comprehensive examination of the Holocaust never fails to mesmerize on all levels of cinema, history and humanity. 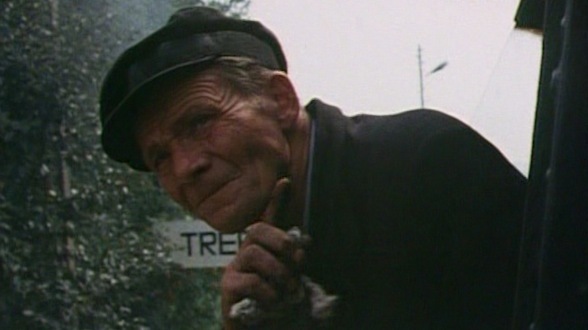 Though never having seen Claude Lanzmann’s lauded and landmark 9-hr film on the Holocaust until now, the effect of watching it today is probably more powerful than it was first released, and likely will become more revelant and revelatory with each passing year. As time goes by and the Holocaust becomes more of an echo of history it’s unavoidable the more distant we become to the subject. Thus, Lanzmann’s exhaustive, comprehensive and ground zero eye witness account of the Holocaust will always keep us tethered to this heinous chapter in human existence. Lanzmann’s modus operandi is clear and always referenced in discussion of the film – strictly interview-style reporting, eye witness accounts only, and no stock footage whatsoever. Lanzmann also avoids a linear narrative, moving back and forth in time, but compartmentalizing the subject into distinct chapters. There’s the Chelmo story, and the mobile gas vans used to kill, the Treblinka story and Auschwitz-Birkenau stories, death camps which saw the extermination of almost 2millions Jews in total, and the Warsaw Ghetto story, and the stories of starvation and rebellion. In his attempt capture and document history part of his method was not to answer the question of ‘why’, but ‘how’. From the details of the how the true horror of the events come to light, the ability of the German to achieve such mass annihilation could only have come from a complex network of operational and business practices drafted and executed. Thus it’s within the details of the mechanism of the death comes the true horror of the Holocaust. One of the details which resounds strongly is from testimony of the German ‘special train’ coordinator whose job it was to schedule the trains to and from Treblinka, that each person (Jewish or not) who was transported by train to a death camp had to be paid for to the train companies. For lack of a better word, each victim had their own ‘ticket’. A massive amount of money paid for by the Nazis through the stolen possessions of their victims - a small but haunting detail which speaks to the horrifying efficiency of the extermination. Same with the thought-out procedures within the death camp, the utmost secracy of the extermination and the elaborate concealment of the fate of the Jews in order to keep any potential riot or intra-camp rebellions from occuring. Each of the details which come out through the 9 hours + running time are told from remarkably composed and articulate interviewees. Despite the tragedy there’s very few tears shed in the film. When tears go shed, (Polish resistance fighter, Jan Karksi for instance) it’s extremely powerful, but the intense focus and emotional detachment from their stories draws us in more. Of course Lanzmann’s interviews were conducted 30-40 years from the events, but the memories recounted are so vivid to the witnesses, it feels like yesterday – a direct connection to the horrible events which, as mentioned, will resound greater as years go by. At nine hours it requires several viewings to take it all in, but Lanzmann always retains an eye for cinema, even when the extensive ‘talking’ threatens to become monotonous, Lanzmann’s approach with each interview is fresh. Sometimes, in the case, of Karski it’s a talking head, formally composed to reflect the personality of the subject. At one point Lanzmann employs a confrontational technique to expose a former camp SS officer working as a bar tender in a humble German pub. At times he places himself in the frame like a television interview interacting with the testimony. The effect of the language barrier helps to increase the dramatic tension as well. At times interview speak German or English, both spoken by Lanzmann much of the time he requires a translator to interpret Polish or Yiddish to French. But the viewer the subtitles only occur over the French translations, thus there’s often a lag between what the interview says and when we understand what he/she says. The effect is subtle but creates a remarkable tension in the time we wait to understand what has been said. By the end of the experience of this film, Lanzmann’s manages to create a vivid picture of horror impossible to forget, and one in which encourages us to rewatch periodically over time. The Criterion Collection edition is a treasure, aided by the exemplary production notes identifying each of the interviewees in order to their testimony as well as include a number of additional interviews by Lanzmann which didn’t make the final cut but are each remarkable and enlightening nonetheless. In particular Jan Karski description of his meeting with Franklyn Delano Roosevelt to relay his first hand eye witness accounts of the Holocaust. Ramaiya Vastavaiya is an upcoming Bollywood romance film directed by Prabhu Deva. He is a choreographer, dancer, actor and director known for his works most widely in kollywood and tollywood. He has also worked for a few Bollywood, Malayalam and Kannada films.